This is the 3rd post in a mini-series looking at this year's FA Cup Semi-Finalists. You know that despite themselves, Spurs have done pretty well this season. Despite the comedy stylings of Heurelho Gomes (who Redknapp doesn’t like) and despite Ledley King only able to play when the wind is blowing from the southeast at 2 knots. Even with Robbie Keane (who ‘urry up doesn’t like) being shipped off to the wilds of Scotia land, plus because of injuries it forced Jamie’s pappy to play Roman Pavlyuchenko, even though… you get the drift. The players always know where they stand with old ‘arry. He’s not afraid to slate a player in public. He will threaten to sell them or farm them off on loan but then do neither and then play them later on when injuries hit the players that he does like. But even then… Crouchy as we’ve seen for England, but at Tottenham he starts on the bench. But despite all of this… They are currently 5th in the table, they got to the Mickey Mouse League Cup Final and I fully expect them to be in the FA Cup Final. So then what music will I post in relation to Tottenham Hotspur ? What choices do I have ? Well you know that when you think of Spurs and music it’s either Chas n’ Dave or: Chris and Glenn. – or the God botherer with some solo efforts, which I’ve previously noted & will never speak of again. But there are other Spurs tunes out there and for today’s output I’ve gone back in time to before Hodges met Peacock, back to 1971 when the team sang of their joy of err… being Tottenham. 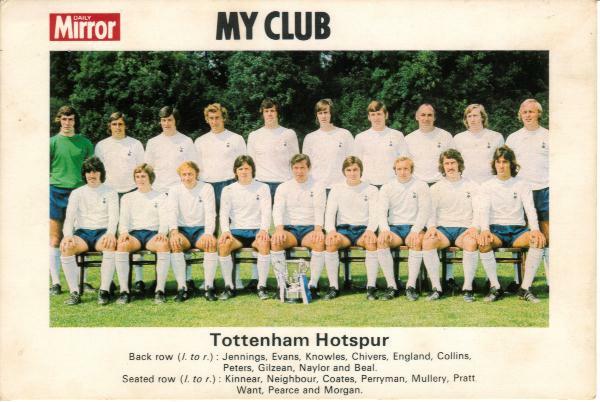 https://www.footballandmusic.co.uk/fitba/halftime/The%201972-73%20Tottenham%20Squad%20-%20Spurs.mp3 » The 1971/72 Tottenham Squad – Spurs !